NETWORK FINALS: There were no changes from this morning’s preliminary ratings. CABLE HIGHLIGHTS: On USA, WWE SMACKDOWN climbed 0.12 from last week’s Election Night airing to 0.80, and PURE COUNTRY premiered at 0.23. History’s CURSE OF OAK ISLAND returned at 0.66, with a lead-in special at 0.39. On Bravo, BELOW DECK gained 0.03 to 0.53, and FLIPPING OUT was up 0.06 to 0.28. MTV’s THE CHALLENGE rose 0.09 to 0.51. ESPN’s BASKETBALL: A LOVE STORY documentary was at 0.37/0.31, and the week’s CFP RANKINGS show was down a mighty 0.83 to 0.34. On Food Network, CHOPPED jumped a tenth to 0.35. Fox News’s TUCKER CARLSON TONIGHT led cable news at 0.32/0.49/2.7M, with MSNBC’s RACHEL MADDOW SHOW at 0.30/0.46/3.2M, and CNN’s recount “ELECTION NIGHT” special at 0.29/0.39/1.4M. On ID, HOME ALONE was at 0.29, and WELCOME TO MURDERTOWN was at 0.24. On TLC, THE LITTLE COUPLE gained 0.06 to 0.29, and 7 LITTLE JOHNSTONS ticked up to 0.24. On A&E, a LEAH REMINI SCIENTOLOGY special was at 0.28. TBS’s THE GUEST BOOK dipped 0.02 to 0.28. 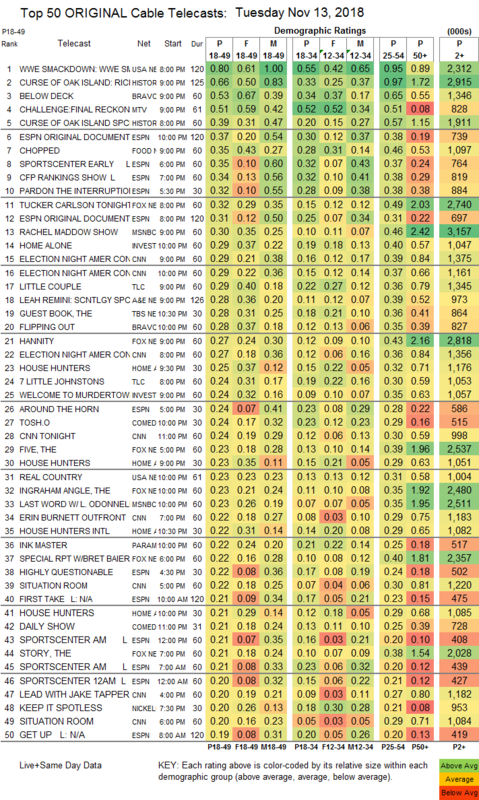 On HGTV, HOUSE HUNTERS was at 0.25/0.23/0.21 compared to last week’s 0.23/0.22, and HOUSE HUNTERS INTL was at 0.22. On Comedy Central, TOSH.0 was steady at 0.24, and THE JIM JEFFERIES SHOW ticked up to 0.12. Paramount’s INK MASTER was at 0.22. On Discovery, VEGAS RAT RODS was at 0.16, and TRANS AM was at 0.14. 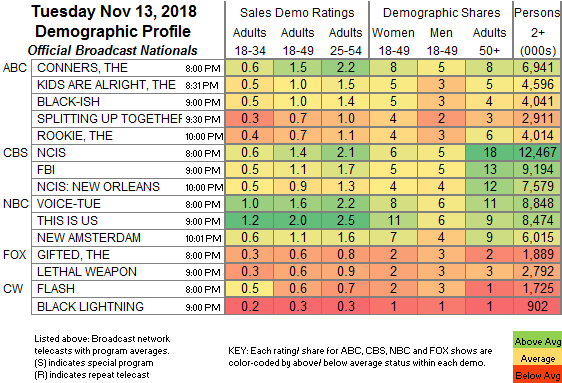 Lifetime’s MARRIED AT FIRST SIGHT: HAPPILY EVER AFTER held at 0.11.